Sometimes it’s hard to get excited about eating a salad. If your like me you get stuck in a rut and make the same things over and over again until you just lose interest. 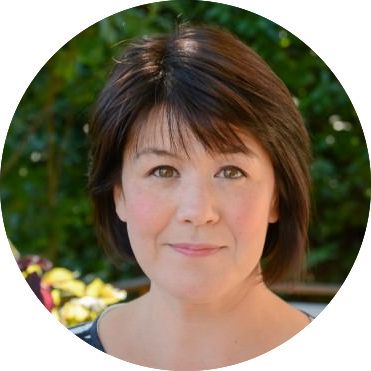 One of the benefits of having a blog is that it pushes you to try new flavor combinations or ingredients that you probably wouldn’t have tried. I’ve been reading about halloumi and what a great vegetarian option it is for years but had never gotten around to trying it before this week. I don’t know what I’ve been waiting for, it is amazing. Halloumi is a cheese made from goat and sheep’s milk and it doesn’t melt over high heat so it’s ideal for grilling or pan frying. Eat it as soon as you can after you take it out of the pan, it’s at it’s most delicious when it’s hot. If you read my blog you know that I make a lot of salads but I have to say that this has got to be one of my favorite salads ever. 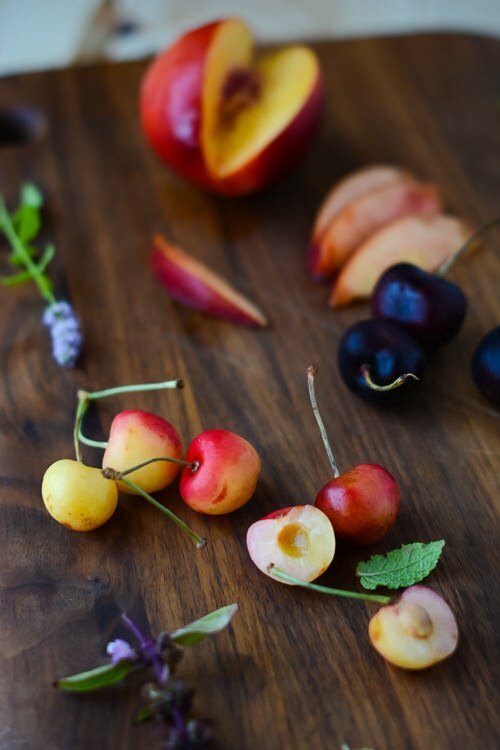 Bursting with all the best flavors of summer it’s loaded with fresh herbs, nectarines, cherries and sweet summer corn and tossed with a simple ginger lime vinaigrette. For a variation, peaches, strawberries and watermelon would all be great substitutions. It's like summer in a bowl. 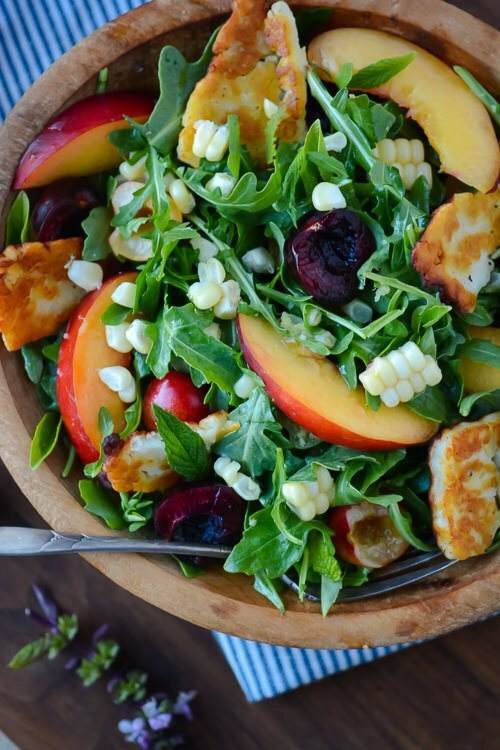 Sweet corn, juicy nectarines, fresh cherries and pan fried halloumi tossed with a ginger lime vinaigrette make the best summer salad you've ever tasted. 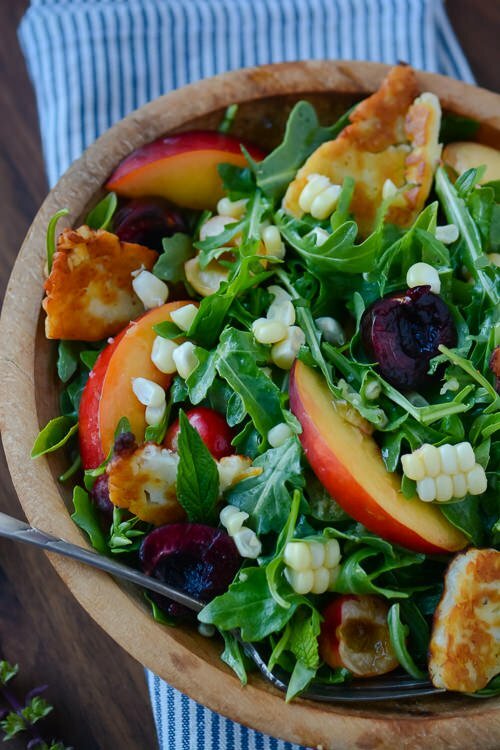 In a large bowl combine the arugula, corn, nectarines, cherries and a handful of the herbs. Pour the dressing over the top and lightly toss to coat all the ingredients. Taste and add more salt or pepper as desired. 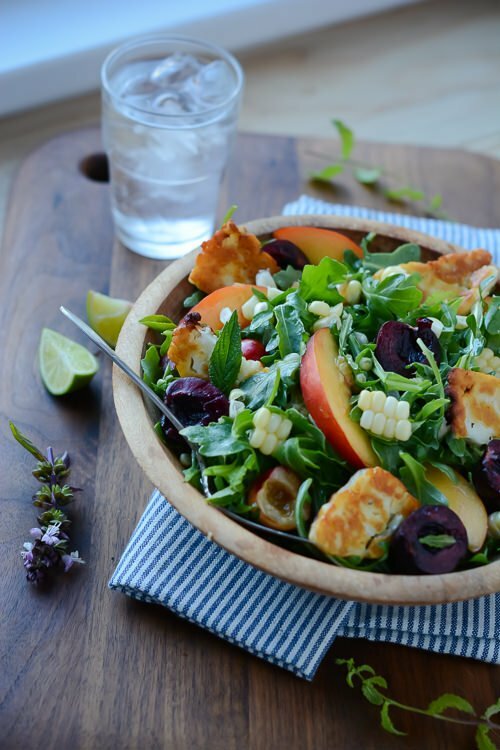 Divide the salad among 4 plates and top with a few slices of the halloumi and a sprinkling of herbs. 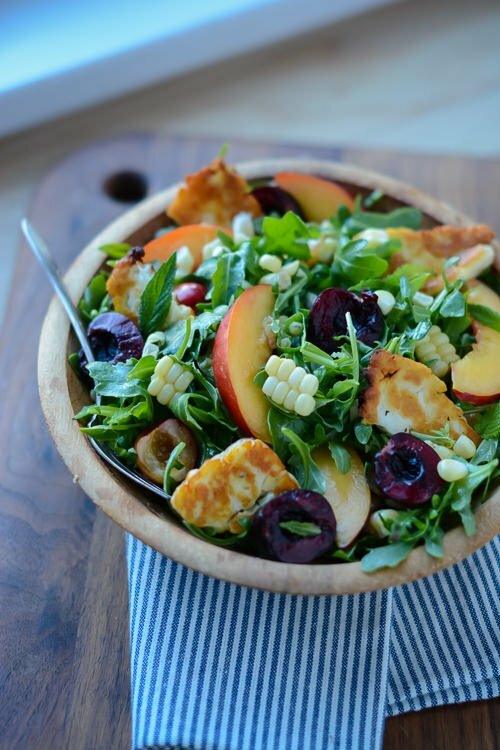 Such a pretty salad! 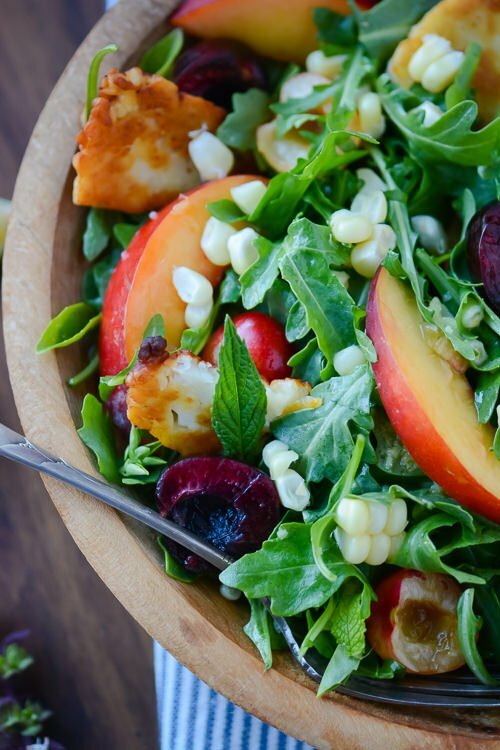 I love the idea of mixing up a simple green salad with cherries and corn. Hooray! Wow! This looks fantastic. I too, have heard of this cheese many times, but have not yet tried it. This gives me the boost to do so. Can’t wait to try. The flavors you combine sound wonderful. Thanks. I highly recommend trying the halloumi, it’s nice and salty and pairs well with fruit. I’ve made this salad three times this week and once I can’t find cherries and nectarines any longer I think I’ll try some peaches or watermelon! 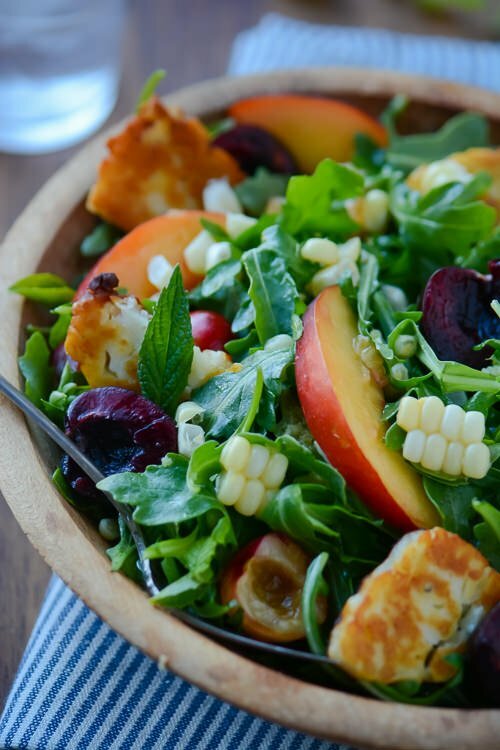 I could dig into this salad anytime, it’s just the perfect summer salad. 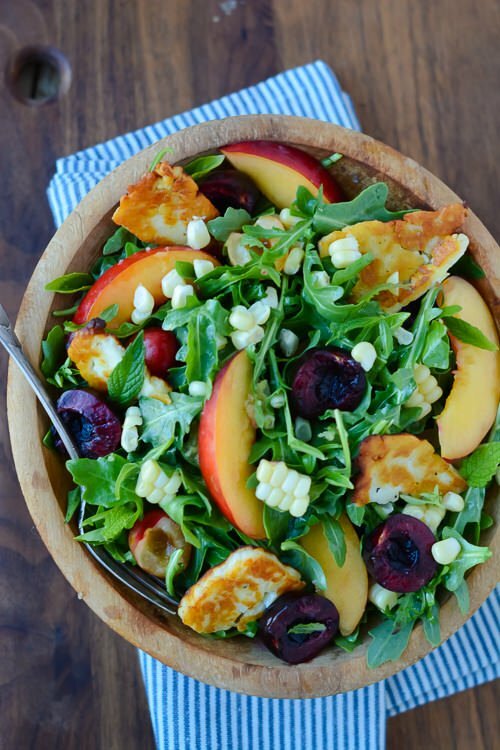 I love the combination of halloumi, cherries, and corn. This has got to be one of my favorite flavor combinations. 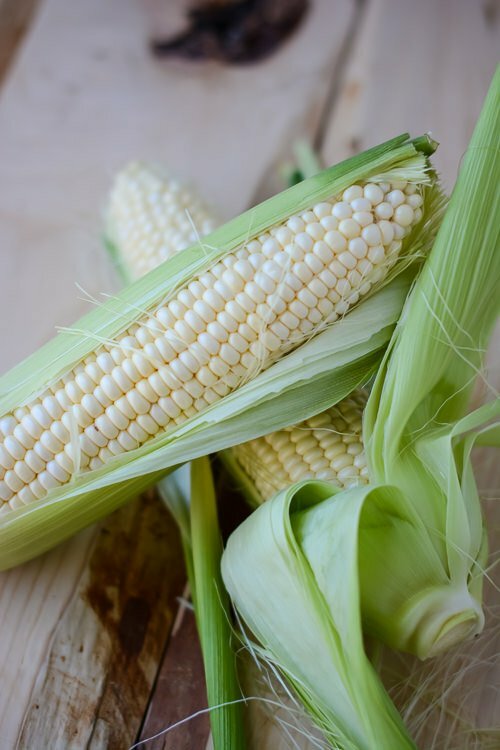 I’m disappointed that cherry season is so short, I’m going to have to come up with another variation so that I can make it a few more times before corn season is over!